s3 – More Mind Spew-age from Harold Spencer Jr. I really enjoy OpenLDAP. I think folks really don’t understand the power of OpenLDAP, concerning its robustness (i.e. use multiple back-ends), speed and efficiency. I think its important to have sandboxes to test various technologies. The “cloud” is the best place for this. To test out the latest builds provided by OpenLDAP (via git), I created a cloud-init script that allows me to configure, build, and install an OpenLDAP sandbox environment in the cloud (on-premise and/or public). This script has been tested on AWS and Eucalyptus using Ubuntu Precise 12.04 LTS. This blog entry is a compliment to my past blog regarding overlays, MDB and OpenLDAP. Downloads all the prerequisites for building OpenLDAP from source, including euca2ools. Adds information into /etc/rc.local to make sure ephemeral gets re-mounted on reboots of the instance, and hostname is set. Configures, builds and installs OpenLDAP. Cloud image that is ready to go – Ubuntu has done a wonderful job with their cloud images. They have made it really easy to access them on AWS. 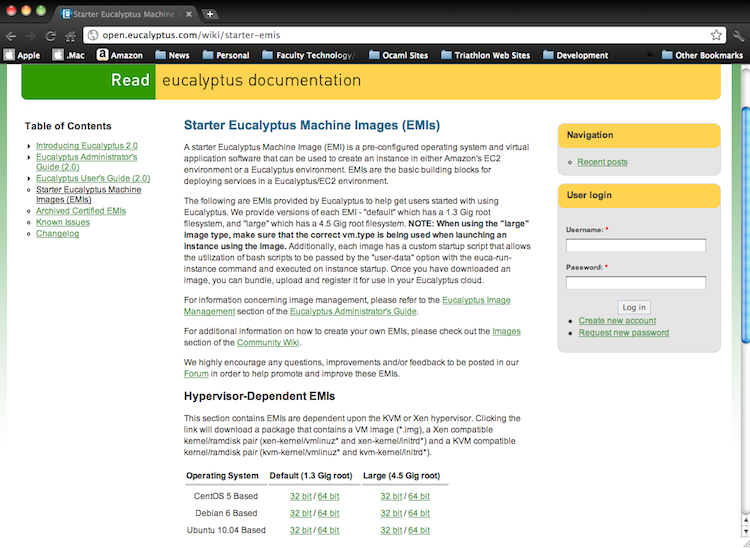 These images can be used on Eucalyptus as well. Public and Private Cloud Deployment – Since Eucalyptus follows the AWS EC2 API very closely, it makes it really easy to test on both AWS and Eucalyptus. Now that the background has been covered a bit, the next section will cover deploying the sandbox on AWS and/or Eucalyptus. Make sure and have an account on AWS and/or Eucalyptus (and the correct AWS/Eucalyptus IAM policies are in place so that you can bundle, upload and register images to AWS S3 and Eucalyptus Walrus). Make sure you have access to a registered AMI/EMI that runs Ubuntu Precise 12.04 LTS. *NOTE* If you are using AWS, you can just go to the Ubuntu Precise Cloud Image download page, and select the AMI in the region that you have access to. Download the openldap cloud-init recipe from Eucalyptus/recipes repository. Download and install the latest Euca2ools (I used the command-line tool euca-run-instances to run these instances). After you have downloaded your credentials from AWS/Eucalyptus, define your global environments by either following the documentation for AWS EC2 or the documentation for Eucalyptus. Your sandbox environment is now set up. From here, just following the instructions in the OpenLDAP Administrator’s Guide on configuring your openldap server, or continue from the “Setup – OLC and MDB” section located in my previous blog. *NOTE* As you configure your openldap server, make sure and use euca-authorize to control access to your instance. In my last blog, I covered three ways Eucalyptus Systems uses the Varnish-Walrus architecture. This blog will cover how eustore takes advantage of this architecture. Eustore is an image management tool developed by David Kavanagh. Its primary goal is to automate image bundling, uploading and registration. The two commands provided by eustore is eustore-describe-images and eustore-install-image. The images found on emis.eucalyptus.com and the JSON configuration file associated with those images are all located in unique Walrus buckets. The images shown in this blog are in the starter-emis bucket. The ACLs for these buckets allow for the objects to be publicly accessible. For more information on Walrus ACLs, please reference the section “Access Control List (ACL) Overview” in the AWS S3 Developer’s Guide. The two commands mentioned above that eustore provides – eustore-describe-images and eustore-install-images – significantly cuts down the number of commands needed to be input by the user. Without using eustore, a user would need to run 3 commands (euca-bundle-image, euca-upload-image, and euca-register) for the kernel, ramdisk, and raw disk image for an EMI (this translates to a total of 9 commands). Data from JSON file is returned to eustore-describe-images. 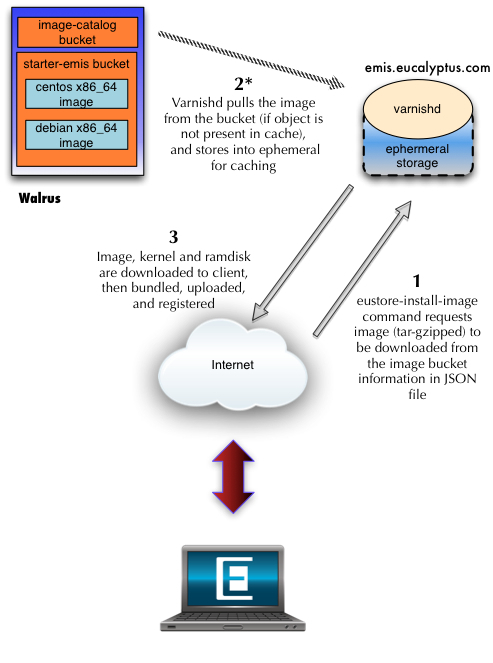 ** If image is not available (euca-centos-2012.1.14-x86_64.tgz) in varnish cache, then varnishd (emis.eucalyptus.com) will pull image from starter-emis bucket and store it in ephemeral space for caching to handle future requests. Once the tar-gzipped file is downloaded, eustore-install-image will bundle, upload, and register the kernel (EKI), ramdisk (ERI) and image (EMI). As demonstrated above, eustore definitely makes image management efficient and user-friendly. 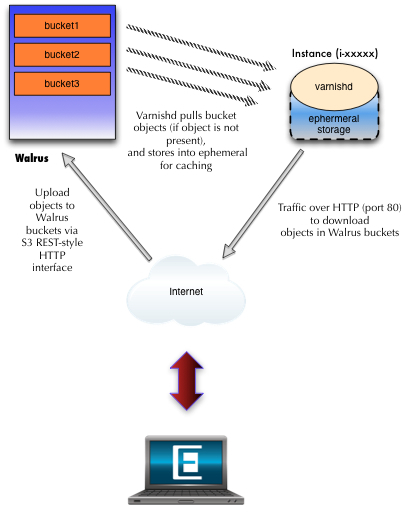 Stay tuned for upcoming blogs discussing more on how the Varnish-Walrus architecture is utilized.